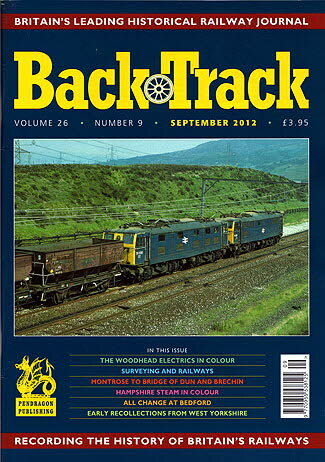 BackTrack September 2012 journal from Pendragon Publishing. Falling by the Wayside - c olour photos of two derailments at Whitchurch (Hants.) with descriptions by Peter Tatlow of the recovery of the engines. Early Recollections from West Yorkshire 1946-57 - W. V. Benson looks back to youthful travels from Keighley. Wrexham and Brymbo - colour shots by Dr. M. H. Yardley of steam on the steelworks branch in North Wales. The Montrose to Bridge of Dun and Brechin branches - by Alistair F. Nisbet. Putting on the Style - Robert Emblin describes the station facades at Nottingham Victoria, Leicester Central and London Marylebone stations. British Railways and Steam Locomotives - Edward Gibbins offers his own views on an enduringly controversial subject from the 1950s/60s. Hampshire Steam - four colour pages of scenes on and off the LSWR main lines. Surveying and Railways - Michael B. Binks introduces the principles of a lesser-known aspect of railway civil engineering. Under the Woodhead Wires - four colour pages of the Woodhead Route's 1,500V dc electric locomotives. Mouldsworth and the Helsby branch of the Cheshire Lines Committee - by Tony Robinson. Multiple Unit Memories - archive photos of the early days of diesel and electric multiple units. Charles Dickens and Railways - Mairead Mahon looks at the influence of railways on the author's writings. All Change at Bedford - Peter Butler reviews railway developments at the county town's station. Sign Here - colour photos of a selection of long-lasting railway notices.